We're here with Helena Soh, who's a social media director. When I first met Helena, she was the social media strategist for PETA. In our conversation today we really bounce around on a multitude of topics that we both know and love– from manifestation to human design, to relationships and activism, and everything in between. Today's episode is with Andy Mant, Founder of BLUblox. In our conversation, Andy shares so much information on blue light, the different colors of the lenses and what they do, and how to hack our surroundings to protect ourselves from light pollution. Join the EXPANDED team in talking through their process of doing the work around this month's theme - self-worth. We're going to be doing these Process episodes every so often because we think it will help all of you to know what we’re going through so that you can implement it in your own work. Danielle Beinstein is To Be Magnetic’s psychological astrologer, as well as Lacy’s personal astrologer and the person who Lacy processes all of her own work with. Ruby Warrington is the founder of The Numinous + the author of Sober Curious. Alexandra Roxo is an artist, writer, and spiritual mentor who takes a uniquely raw and sensual approach to healing and transformation. Today, she shares her origin story, her experience hitting deep rock bottom, and the spiritual slap in the face that set her on a journey dedicated to being of service and helping other women. Jeannette Ogden, the force behind the blog and Instagram account Shut The Kale Up, joins Lacy on this episode of the EXPANDED Podcast. Jeannette shares her story with unflinching honesty and grace, covering a wide range of topics including how she made the leap to become an influencer full-time, growing up with an alcoholic mom, climbing out of debt, overcoming body-image issues, her journey to motherhood, and falling in love. She’s such an incredible example of the power of owning your shadow and an expander to anyone on the quest to live a meaningful, healthy, and family-focused life. Transformational coach and entrepreneur Luke Storey joins Lacy on this episode of the EXPANDED Podcast. Luke’s story is powerful and broad-ranging, from being a young drug addict to being a celebrity stylist to becoming a speaker, coach, and entrepreneur. He shares his lowest points as a heroin addict, his journey to getting sober, his consciousness practices, and accessible ways that anyone can improve their mental and physical health by getting aligned with the rhythms of nature. He’s a massive expander for anyone interested in biohacking, consciousness and sobriety. Reiki and energy healer Lara Elliott joins Lacy on this episode of the EXPANDED Podcast. Lara shares how her background in fashion eventually led to her career as a multi-modality healer. She openly shares her advice for differentiating yourself within the wellness industry, shares her challenging yet rewarding journey to becoming a mother, and inspires us to trust that success will come when we become the most authentic versions of ourselves and do what we love. Every so often we do a special podcast episode where Lacy answers all your manifestation questions to give you a sneak peek into SUPPORTED, our bi-monthly online manifestation class. In this episode, Lacy and Lila discuss a wide range of topics including cultivating subconscious deservingness, losing friendships as you become more conscious, and the energetics of financial dependence. Agnes Baddoo, designer and fashion entrepreneur, joins Lacy on this episode of the EXPANDED Podcast. Agnes shares with us her Afro-Caribbean heritage, NYC upbringing and how her stylish parents expanded her to manifest her own career in styling and eventually starting her own gender-neutral leather goods brand. She offers business advice for those of you interested in starting your own entrepreneurial ventures, shares how her low points in life have contributed to her journey and inspires all of us to pay attention the kismet connections in our lives. Jenna Zoe, Lacy’s Human Design reader, returns to the EXPANDED Podcast with this special episode. Jenna answers questions about how to use Human Design to optimize your manifestation practice, how living in your design can help you heal and discover your purpose, and how de-conditioning your beliefs can transform the way you live your life. This episode will be expansive for anyone looking to understand themselves more deeply. Shaman Durek, a spiritual guide and healer, joins Lacy on this episode of the EXPANDED Podcast. He talks about his deep lineage of healers and rebelling against his disapproving father to build his shamanic powers. He teaches us how to speak with spirits and how each person can step into their own unique gifts. This episode is a wild ride of spirituality and ancient wisdom that’s sure to expand anyone curious about shamanism, other realms, and living a more conscious life. Find the show notes for this episode, a video of the interview, and more by heading to tobemagnetic.com and clicking on the EXPANDED Podcast at the top. Bo Carney, co-founder of Mohawk General Store, joins Lacy on this episode of the EXPANDED Podcast. She shares the story of her international upbringing, meeting and going into business with her husband, and following her intuition and personal style to create the wildly popular Mohawk General Store. She’s a massive expander for fashion entrepreneurs, those interested in living or studying internationally, and anyone who is afraid to make the leap to achieve their dreams. Find the show notes for this episode, a video of the interview, and more by heading to tobemagnetic.com and clicking on the EXPANDED Podcast at the top. Max Kingery, Lacy’s fiancée and co-founder of the clothing brand Olderbrother, joins Lacy on this episode of the EXPANDED Podcast. Max shares how he overcame addiction, began working in fashion and worked his way up to starting his own eco-sustainable, gender-neutral clothing brand, using only natural dyes and fabrics. Lacy and Max also discuss how they met, how they balance work and their relationship and sneak some funny personal stories in between. Find the show notes for this episode, a video of the interview, and more by heading to tobemagnetic.com and clicking on the EXPANDED Podcast at the top. Martha Soffer joins Lacy on this episode of the EXPANDED Podcast. She shares her journey of becoming an Ayurvedic practitioner, which she has practiced for over 30 years. Her passion for healing with Ayurveda inspired her to open Surya Spa with her husband, which has grown tenfold since its beginning. Martha discusses how she started her business, practices for healing with Ayurveda, preparing for becoming a parent and so much more in this rich episode. Find the show notes for this episode, a video of the interview, and more by heading to tobemagnetic.com and clicking on the EXPANDED Podcast at the top. Natalie Miles joins Lacy on this episode of the EXPANDED Podcast to share her journey to becoming a full-time psychic intuitive and spiritual mentor. Her spirit guide first came to her at age 5 and she grew up navigating her psychic gifts. Fully embracing and channeling them she now empowers her clients by communicating their own spirit guides’ messages without providing future projections. She works to teach people how to connect with their intuition so they can begin to encode the messages themselves. Find the show notes for this episode, a video of the interview, and more by heading to tobemagnetic.com and clicking on the EXPANDED Podcast at the top. Katie Dalebout, author and podcaster behind “Let it Out,” joins lacy on this episode of the EXPANDED Podcast. Katie shares her path from growing up in a small town in Michigan to living in NYC and hosting her own podcast while teaching others to do the same. She talks about her struggle with body image and an eating disorder that led her to find intuitive eating and wellness practices. She is a massive expander for anyone that has experienced body image issues, those interested in the world of podcasting, or anyone on their journey to reclaiming their authentic self. Find the show notes for this episode, a video of the interview, and more by heading to tobemagnetic.com and clicking on the EXPANDED Podcast at the top. Esteemed global meditation teacher and founder of Communal LA, Mariana Orkenyi, joins Lacy on this episode of the EXPANDED Podcast. Mariana shares how she found her path to teaching meditation, building Communal LA and her multicultural background, world traveling and motherhood. This episode will be expansive for all listeners, as well as though learning to navigate their own intuitive gifts. Find the show notes for this episode, a video of the interview, and more by heading to tobemagnetic.com and clicking on the EXPANDED Podcast at the top. In this special podcast episode, Lacy gives you a taste of her manifestation class, SUPPORTED by answering your manifestation questions with Lila. They discuss everything from peripheral triggers, energetic tests, Reprogramming, and relationships. Find the show notes for this episode, a video of the interview, and more by heading to tobemagnetic.com and clicking on the EXPANDED Podcast at the top. Beth Behrs, actress and activist, joins episode 14 of the EXPANDED Podcast. She shares how she was drawn to helping sexual assault victims which eventually led to her founding She Herd Power, a non-profit equine therapy foundation that provides immersive healing programs for female survivors. Beth is also an all-star manifestor and talks about how she used Formula and Magnetism to manifest her latest role in The Neighborhood. She is a massive expander for any actor or artist looking to find both success and deep-rooted contentment. Find the show notes for this episode, a video of the interview, and more by heading to tobemagnetic.com and clicking on the EXPANDED Podcast at the top. Mark Groves joins this episode of the EXPANDED Podcast to discuss his journey to learning about and understanding human connection and behavior. He shares the teachings and programmings he adopted from his parents and upbringing, as well as the reprogramming he had to go through in order to find his authentic path. Mark also shares his advice for creating the love you want and nurturing your relationships as the nature of partnership continues to evolve in this day and age. Find the show notes for this episode, a video of the interview, and more by heading to tobemagnetic.com and clicking on the EXPANDED Podcast at the top. Chloe Garcia Ponce, otherworldly curandera, channel and herbalist joins episode 12 of the EXPANDED Podcast. She shares how her multicultural upbringing has shaped her life and Nomadic Songlines, her healing practice. She talks about how to heal from trauma, embrace forgiveness, and balance the masculine and feminine. Chloe is one of Lacy’s personal healers and has so much wisdom to offer anyone looking to come into their authentic truth and learn to trust in the healing process. Find the show notes for this episode, a video of the interview, and more by heading to tobemagnetic.com and clicking on the EXPANDED Podcast at the top. Nadine Artemis, founder of Living Libations and author of Renegade Beauty, joins episode 11 of the EXPANDED Podcast. She shares how her journey has led her to create science-backed holistic beauty products and practices. She talks about everything from studying women’s anthropology to microbiome health to dental care. Nadine is one of Lacy’s personal health and beauty expanders and is a wealth of knowledge and expansion for all looking to live well. Find the show notes for this episode, a video of the interview, and more by heading to tobemagnetic.com and clicking on the EXPANDED Podcast at the top. Shiva Rose, author of Whole Beauty and The Local Rose Blog, and founder of Shiva Rose Beauty joins episode 10 of The EXPANDED Podcast. She shares her journey from being an Iranian refugee, acclimating to American life and how she put herself through school at UCLA. Her story of being an actress, going through a divorce as a mother and becoming an entrepreneur is expanding for all as she shares how she rebuilt herself from her absolute rock bottom. Find the show notes for this episode, a video of the interview, and more by heading to tobemagnetic.com and clicking on the EXPANDED Podcast at the top. Deborah Hanekamp, Seeress and founder of Space by Mama Medicine, joins Lacy on this episode of the EXPANDED Podcast. She grew up in rural Connecticut and was able to see auras from a young age. A series of tragedies in her life nudged her further down the spiritual path in her late teens, leading her to do an 8-year apprenticeship in the Amazon. Deborah eventually crafted her own unique healing modality and became known as Mama Medicine. In this episode, she talks about learning to trust the guidance of the universe, how she uses her painful past experiences to help others, and what it means to be your own healer. Find the show notes for this episode, a video of the interview, and more by heading to tobemagnetic.com and clicking on the EXPANDED Podcast at the top. Sahara Rose, author and Ayurvedic practitioner, joins Lacy on this episode of The EXPANDED Podcast. She shares her story of freeing herself from constantly seeking her parents’ approval to her rock bottom in Bali, to finding her path, UNBLOCKING and writing a best-selling book. Sahara has found a way to translate ancient Eastern teachings and Ayurvedic principles into an approachable, modern and universal practice that we can all learn from to reach ultimate balance and health. We’re so beyond expanded by Sahara’s journey and cannot wait to share this episode with you. Find the show notes for this episode, a video of the interview, and more by heading to tobemagnetic.com and clicking on the EXPANDED Podcast at the top. On this episode of the EXPANDED Podcast, we welcome Lacy’s personal health expander Maggie Harrsen of Puakai Healing. Maggie shares her journey from severe illness to exploring allopathic treatment and finally finding healing and recovery by connecting back with nature. Maggie’s health journey also took her to Peru where she learned about energy healing and energy cleansing. These practices are what inspired her to build Puakai, to inspire everyone to trust in their own power to heal with support of the nature we have so readily available around us. Find the show notes for this episode, a video of the interview, and more by heading to tobemagnetic.com and clicking on the EXPANDED Podcast at the top. Mel Nahas, Lacy’s personal business expander and the co-founder of Conscious City Guide, joins us on this episode of the EXPANDED Podcast. Mel shares the story of her unique cultural background and upbringing, how she navigated changing careers in her 30s, and the lows she hit that led her to launch into consciousness. Mel's story is an expander for anyone who's manifesting their dream business and looking to make a conscious impact in the world – even if you're currently finding yourself in your lowest of lows. Find the show notes for this episode, a video of the interview, and more by heading to tobemagnetic.com and clicking on the EXPANDED Podcast at the top. Lacy’s personal go-to psychological astrologer, Danielle Beinstein, joins us on this episode of the EXPANDED Podcast. She shares with us how she evolved in her spiritual path, got her masters in spiritual psychology, and what’s led her to grow a niche business based on a grounded, practical approach to astrology. Danielle gifts us some insight into the stars and sprinkles about some personal stories, like how she manifested her current boyfriend. Find the show notes for this episode, a video of the interview, and more by heading to tobemagnetic.com and clicking on the EXPANDED Podcast at the top. Krista Williams and Lindsey Simcik from The Almost 30 Podcast join Lacy on the fourth episode of The EXPANDED Podcast with Lacy Phillips. They discuss their journey from recording their first episodes of Almost 30 Podcast on the floor of their closet to now hosting a nationally top-ranked podcast with thousands of listeners. Krista and Lindsey share what personal struggles they've faced along the way, from family, relationships, and career. This is our most intimate episode yet and we're so grateful for these wonderful, open and honest women. Find the show notes for this episode, a video of the interview, and more by heading to tobemagnetic.com and clicking on the EXPANDED Podcast at the top. On this episode of The EXPANDED Podcast with Lacy Phillips, join Erica Chidi Cohen, author, doula, co-founder of LOOM and a champion of women’s rights and reproductive health. Erica discusses how her diverse background of culinary training and studies in art history and media led her to become a successful entrepreneur and educator, supporting and empowering women from family planning, birthing support, reproductive and hormonal health, and menstruation. She also shares with us the self-tools she uses to find clarity and navigate the murky, confusing times we all encounter on our paths. Find the show notes for this episode, a video of the interview, a full transcript and more by heading to tobemagnetic.com and clicking on the EXPANDED Podcast at the top. In this episode, Lacy talks to certified nutritionist, functional medicine practitioner, and cognitive behavioral therapist, Dana James. Dana shares her personal journey transitioning from a life in finance to her career today, through love and heartbreak, learning to be seen, writing her first book, The Archetype Diet, and how she’s found balance within her own archetype: the wonder woman. Find the show notes for this episode, a video of the interview, a full transcript and more by heading to tobemagnetic.com and clicking on the EXPANDED Podcast at the top. Lacy kicks off the Expanded Podcast talking to her personal Human Design Reader, Jenna Zoe. Jenna’s work is centered around guiding her clients to rediscover who they came to be by living in their design and finding their purpose here on Earth. Find the show notes for this episode, a video of the interview, a full transcript and more by heading to tobemagnetic.com and clicking on the EXPANDED Podcast at the top. 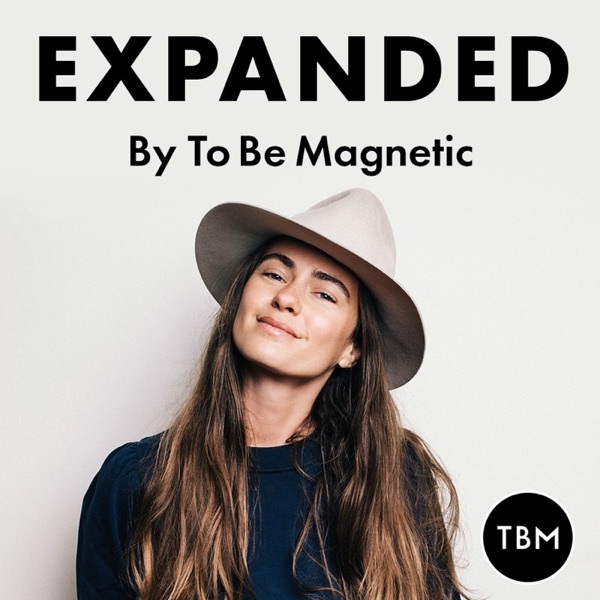 The EXPANDED Podcast with Lacy Phillips, founder of To Be Magnetic, shares the stories of those within the wellness industry and how they got to where they are today. Their stories are meant to serve as expanders for others to 'see to believe' that what you desire is possible. Find the show notes for all of our episodes, videos of the interviews, transcripts and more by heading to tobemagnetic.com and clicking on the EXPANDED Podcast at the top.